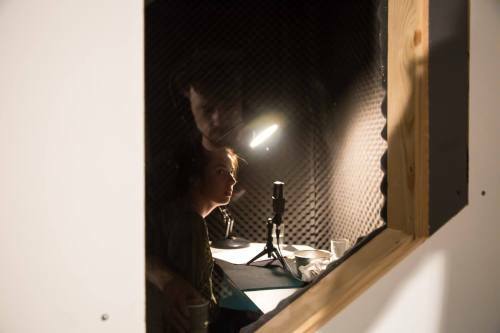 Helena Haimes talks to four members* of London-based research project The Disembodied Voice about the benefits of an open-ended approach to artistic research. Artists’ research group The Disembodied Voice was established by Karin Kihlberg and Reuben Henry in October 2014. The group’s aim is to broadly explore relationships between the disembodied voice and visual culture, and is made up of Kihlberg and Henry, Maia Conran,Patrick Coyle and Karen Di Franco – practitioners who work across art, film, curating, archiving, performance and writing. 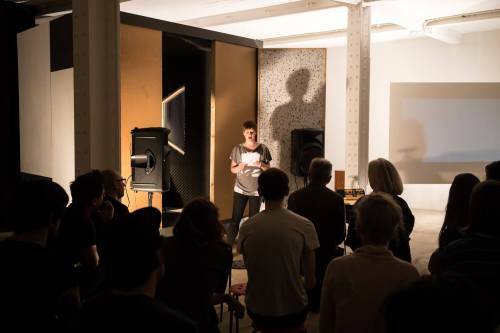 The Disembodied Voice acts a framework to investigate these connections, both through group workshops and public presentations. Research projects have involved meeting with Dr Stephen Dance, an acoustic research scientist, at London South Bank University’s anechoic chamber. Ideas developed from workshops and discussions manifest through public events, most recently for Man Made Structures and The Disembodied Voice, X Marks The Bokship at Matt’s Gallery, where several works in progress connecting the voice with architecture and objects were presented as a screening and seminar. Helena Haimes: So, Karin, what made you and Reuben choose the disembodied voice as a research theme? Karin Kihlberg: It’s something that we’ve covered in our practice over quite a long period of time (the duo have experimented with narration extensively in their moving image and performance work.) And it just so happened that we were invited by Vision Forum in Sweden to initiate a project – they run several nodes throughout the world. Then we thought that it would be really interesting to focus on one part of our practice, to take one aspect of it and develop it from there. HH: Why did you choose to focus on the voice in particular? KK: We thought it was a really complex theme that could be challenged and investigated a lot more. We’ve been at the Jan Van Eyck Academie for a couple of years, where one of the advising researchers was Mladan Dolar, who’s done lots of writing on the voice. So, it was haunting us but we hadn’t quite had the opportunity to properly explore it. HH: How would you say the Disembodied Voice manifests itself in your individual practices? KK: We work a lot with video and use voiceover as a way of telling stories, so it was a very straightforward entry point for us. Reuben Henry: We’ve been working a lot with voiceover and moving image, and have become more and more engaged in how the voice and image develop in relation to one-another, rather than voice being placed over image in the classic narrative sense. The image in our work is treated often as a kind of internal image which is summoned by spoken language, a kind of associative symbiosis where images fall out of the mouth along with the words. So the idea of a narrator, who we don’t see, connects to the viewer not just through the voice but revealing themselves through the images that, beyond their control, are popping up on the screen. Karen Di Franco: I have more of a curatorial rather than an artistic practice. I work a lot with archives, of artists or organisations, so my relationship to the disembodied voice tends to anchor itself around exploring documents, and the individual or collaborative voices that occur through the process of documentation. That could be looking at documentation of practice or correspondence, anything that occurs while exploring archives. I’ve also recently got a commission to make a radio broadcast for Modulations, connected toResonance FM. It directly addresses the idea of the disembodied voice and it’s forced me to produce content in a way that’s connected and will involve the group. Patrick Coyle: Initially, I felt The Disembodied Voice to be a pertinent lens through which to view my practice because of my regular use of the format of ‘a reading’, considering the idea that any scripted text is a disembodied voice to some extent. In more recent performances The Disembodied Voice takes on added meaning through my lack of physical presence, such as the events at Danielle Arnaud, where I sent a series of recordings of myself humming in different places. HH: Patrick, how do you find it working with the group remotely from the States? PC: From my perspective it’s been a good experience working within the added constraints of physical distance and different time zones. 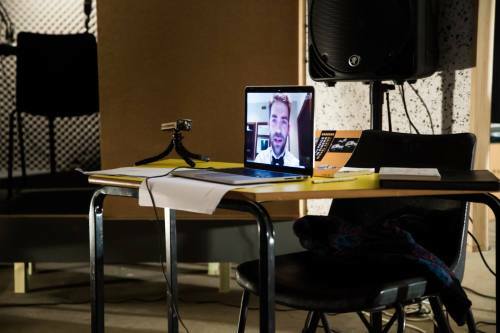 For example, coordinating a performance over Skype from the US that responded to the presentations and informal comments of the other members and invited guests over the course of a day-long event in London (Man Made Structures and The Disembodied Voice). Generally, the group gives me a greater sense of clarity in how I might define and reconsider my work in relation to the idea of the disembodied voice. It has also offered a candid view of other artists’ practices that I would not have otherwise seen. MC: It was part of the Cast of the Crystal Set – for which Bokship had built a bespoke recording studio in the gallery. The Disembodied Voice spent the day recording in the studio and then had a public event in the evening, where Reuben, Patrick and I each spoke and presented our individual material. We also invited Michiel Huijben to give a lecture titled ‘Becoming a Building’. My contribution was a live and recorded reading of the script for ‘Meat’, a film project (in development) which draws a portrait of a film studio lighting rig using footage of the rig in action, psycho-narration voiceover by the rig, and dialogue from the rig to Meat – an animated monkey who climbs about in the metal bars of the rig. I read and recorded the voiceover narration during the day, and then played my recording and read the remainder of the script live in the evening. PC: I enjoyed the challenge of transcribing the other speakers’ comments live and then compiling them into a (semi-) coherent script. From what I heard from those present, it set up an interesting ambiguity between which elements of my spoken performance were deliberate repetitions and pauses, and which ones were the result of glitches and delays caused by the wifi connection or the broadcasting software. It was also important that I was able to see some faces in the audience (via webcam), as this helped me gauge their general interest and engagement in what I was doing. RH: Those glitches in Patrick’s transmission were really interesting. As an authentic disembodied voice (re-embodied in his image on a laptop), Patrick gained a certain power or ‘untouchability’, so long as he held the audience’s attention. But those glitches somehow re-empowered the audience, gave them little giggles that Patrick wouldn’t have quite understood, but which played perfectly into the broken rhythms of his delivery. For us, the day was spent with an actress trying to develop what might be a voice for the room. It came out of thinking of architecture as an extension of its inhabitants, and how the voice is given much of its character through its reverberation in space. The room in that way can be seen as a kind of extension of the body via the voice. We recorded a series of statements about the voice and the room, in the actress’s ridiculous variety of voices, accents and impediments, describing that particular voice and how that voice affected the room, or vice versa. HH: Is there anything about the way the group is set up that makes it especially interesting as a model? KDF: I think what’s really interesting about this project is that it’s true open-ended research, which is very rare in this environment. We’re allowed to set the timeframes and the outcomes we want, which is important, and it also means we’re involved in an ongoing process of discussion among ourselves and with, for example, a public audience. We can decide whether we have public outcomes or not too. HH: Is that because of the way the project’s funded? KK: Yes, it’s funded through the Arts Council and Vision Forum, which is part of Linköping University. But I think the structure of it is more something we’ve decided, and it’s also something to do with the nature of research. Reuben and I have worked a lot as researchers, and within that world there’s the expectation that you have the initial research period and from that you should have this project that you put forward to the public, and that’s the end of the process. But we were interested in having a process where we could make more use of the research, so there would be an element of stepping into the studio and coming out into the group to test thoughts and ideas in a comfortable setting, then moments of punctuation where we ask the public to join us in the conversation – which adds a different challenge to the work or helps to clarify it in some way. MC: That type of public involvement has a function in the process as well, so it brings something to a bit of a point, but not a complete end point, which is really nice. It means you carry on afterwards. KK: That’s the difference. I think often for me the problem is working towards this end point which is public, but isn’t necessarily counted as a public output. It’s not conclusive, and that’s quite exciting – the feeling of putting something out to the public as an experiment. HH: How does being in the group operate alongside an academic life? (Conran is in the second year of a practice-based PhD at Queen Mary University of London, and Di Franco starts her PhD researching artists’ publishing with Tate and the University of Reading a few weeks after this interview). MC: It’s fed in a lot. I gave lectures to my students (on the MA Filmmaking course at the University of East London) about the voice, because it fitted with their course. In terms of my PhD, I’m still very much at the beginning, and figuring out the role that practice has in academic research is really complicated, plus the emphasis within the university is often on the written rather than the practice element. KDF: I work at Chelsea Space (set within Chelsea College of Art and Design), where I do some teaching and I’m about to start a PhD. So I don’t know how relevant the separation of the academic work I do, in relation to other types of work, is, as the two are interconnected, as is practice in this context. MC: Though it’s informed my PhD quite a lot. I’ll end up writing a chapter on the voice if I’m not careful! HH: It just seems as if you’ve got a very valid and effective research model. Isn’t that what academia’s supposed to be about? MC: Though weirdly, without the pressure, this project’s produced a lot of evidence. It’s just done it naturally. KDF: It’s what artists do anyway: you research, you make, you produce, you demonstrate. KK: I feel as if we’re all able to exist autonomously within the collaboration. It’s really exciting to hear that you’ve taken this project in order to propose another project, and that it’s feeding into your research. It’s done the same for Reuben and I – we’ve taken elements of it and talked about it ( at the Tate, for instance). It informs our individual practices without being forced. I think it wouldn’t be some artists’ cup of tea to work the way we do, to share ideas in formation. You have to have generosity and trust, and not to feel too precious about authorship! *US-based Patrick Coyle contributed his responses to this interview remotely.